The latest big fine by the FCC against a TV network... was brought about by a mere three people who actually composed letters of complaint. Yes, just three people. 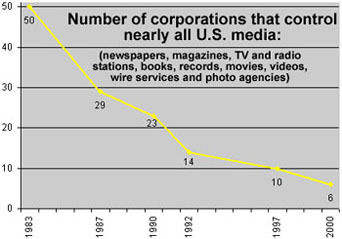 In general, consolidation of established media causes political and economic incentives for what those media broadcast to be least-common-demoninator material suitable for all. As a result, fairness in media comes up regularly in conversation these days; for example, last night David Letterman and Howard Stern were discussing how Clear Channel wields extraordinary power in owning over 1200 radio stations, causing Stern to take himself Siruisly. I no longer believe that blogs are just a complement to established media. Blogs enable much more, representing an ever-widening range of voices as broadcast's range of voices continues to narrow, creating an emergent democracy of intertwingled ideas and interactions.